Responsibility for feeding, veterinary care, safety and general well-being of the tortoise rests with the adoptive family. Children should not be solely responsible for the care of the tortoise. 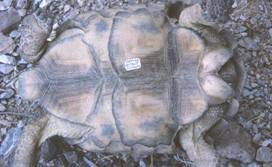 Dogs can pose a deadly threat to your captive desert tortoise. There have been many cases where even well behaved dogs have mauled desert tortoises, resulting in severe injuries, amputations and expensive veterinarian bills. 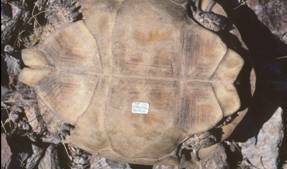 In some cases, the injuries were so severe that the tortoise had to be euthanized. Those with dogs should provide time for the dog to get acclimate to the tortoise. If your dog expresses any interest in the tortoise, you will need to construct a barrier that is high enough to exclude the dog. Desert tortoises must be housed separately from other species of turtles or tortoises, as potentially fatal diseases and parasites can be spread among species. Tortoises are reptiles and it cannot regulate its body temperature like warm-blooded animals. Instead, your tortoise needs to spend much of its time in a thick-walled, insulating shelter which will provide refuge from temperatures that are too hot and too cold. To keep cool in the summer, the tortoise will remain in its shelter most of the day, but will come out briefly to feed in early morning and early evening. 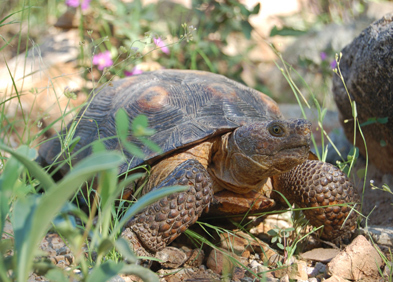 In winter, a desert tortoise will hibernate and emerge only on the very warmest days. If the tortoise does not hibernate it may be sick and should be checked out by a veterinarian. Arizona residents are allowed to adopt one tortoise per person in your household, as long as the tortoises are all the same gender and housed completely separate. If you already have a desert tortoise obtained through other legal means, you can only adopt another if it is the same gender to prevent illegal breeding, and it is recommended that you construct a separate enclosure. Each year there are approximately 400 to 500 desert tortoises needing adoption statewide, including hundreds of hatchling tortoises bred in captivity. Caring for this many young tortoises hinders the state’s overall desert tortoise conservation efforts. Captive born hatchlings must be either given to a responsible adopter or turned over to a state-sanctioned adoption facility within 24 months of hatching. Note: the Department will not take groups of hatchlings/juveniles unless the adult female is surrendered to the Tortoise Adoption Program. You can distinguish males from females, only after they have reached 8 years of age. The plastron, or bottom part of the shell, is concave towards the rear in males, while it is flat in females. The underside of a male desert tortoise, showing the concavity towards the rear (right of picture). The flat underside of a female desert tortoise. Be aware that tortoises, like all reptiles, carry the bacteria salmonella in their digestive tracts. Humans can become infected with a disease, salmonellosis, through contact with feces of a turtle that has the salmonella bacteria. Children are at a high risk of salmonellosis infection from turtles because they are more likely to play with turtles, especially small turtles and put them in their mouths. To learn more about risks associated with turtles and salmonellosis, visit the Food and Drug Administration’s Center for Veterinary Medicine website.